Hello everyone! My apologies for being somewhat quiet lately. I’ve been dealing with a case of sinusitis. It’s the first time I have ever experienced this and it’s not fun at all. Here’s wishing for a great rest of the week! It’s great to be back. 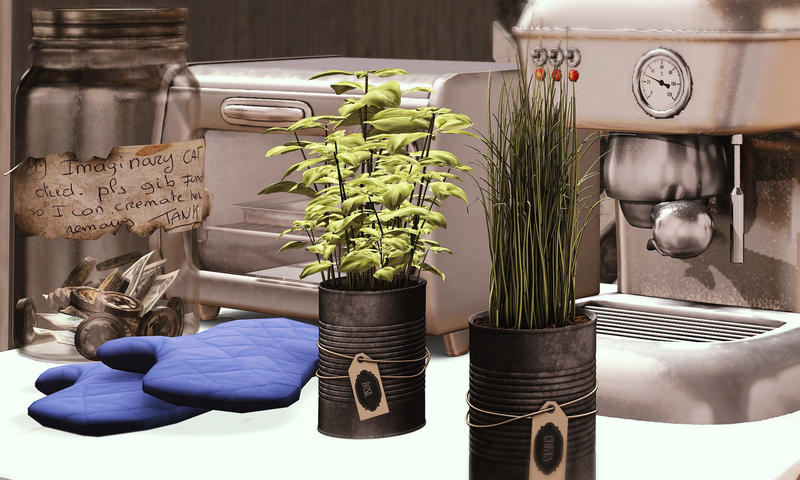 I’m excited to be featuring a new main store release by Dust Bunny. 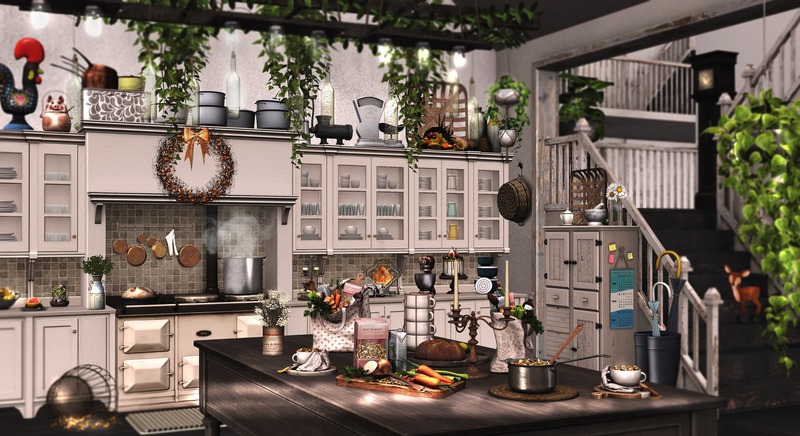 It’s kitchen clutter and each and every piece is just so well done not to mention very pretty. 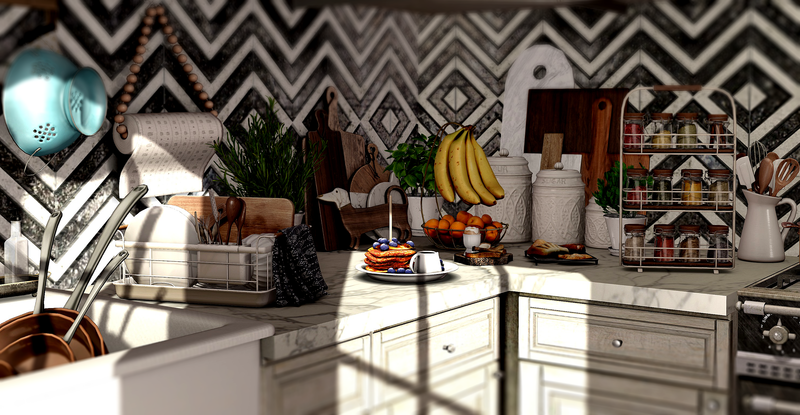 Kitchens are one of my favorite spaces to decor, especially when you have items like this that make it feel warm and cozy and lived in. Of all the pieces, the banana hanger with the fruit is my favorite. I love fresh fruit and unless its not in season I love having bananas, pears, peaches, plums and mango in the house to snack on. It’s also nice to see creators do main store releases. I recently completed a survey for another creator and one of the questions was do you prefer to shop at the main store or at events. I personally prefer the store. It gets me to take a look at what else they have that I don’t already own and need want and yes absolutely need too. 🙂 More main store releases please. Now off to wash those pans in the sink. In reality I am going to bed, which is where I was heading until I remembered that I mentioned in my last post that I would be posting later tonight. Hello everyone! No time today to go into anything, just enough time to post and get going again. Good morning! I love these modular set of Italian town buildings because they’re gorgeous and anything Italian reminds me of someone close to me. There are three buildings in the set all in slightly different sizes, details below. 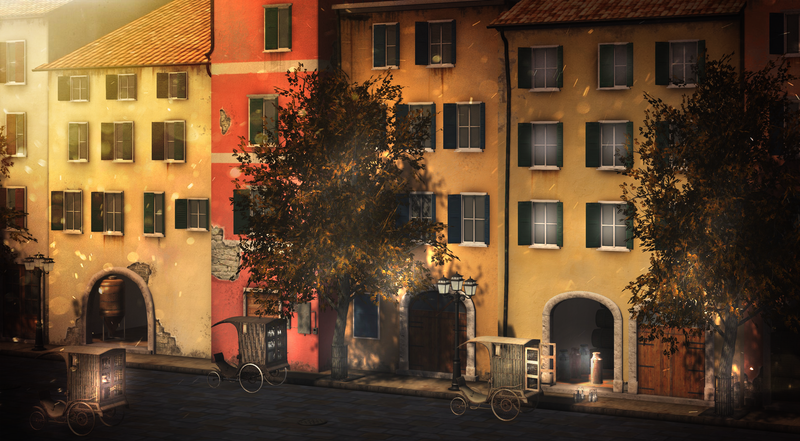 They really are wonderful if you’re looking to create your own town or even great for backdrops. 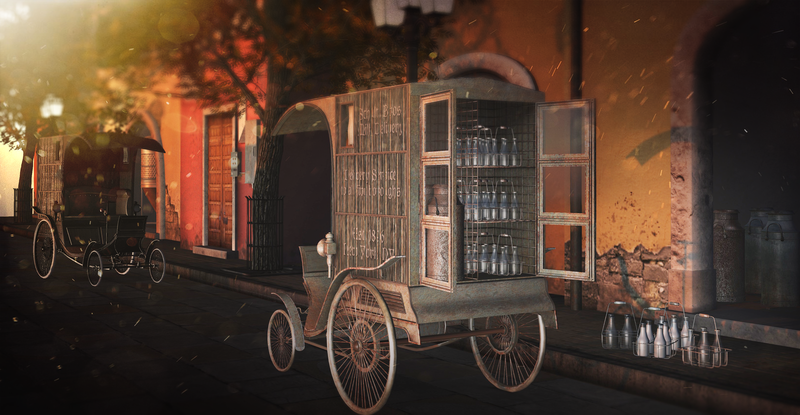 I’m also showcasing a new release by Schultz Bros., which is the 1896 delivery truck set with old and new milk bottles and canisters. The details of all items shown are just absolutely amazing. I’m also showing a new release of trees by Little Branch at Uber. The white ash tree is seasonal, so on click pick your season. I know a lot of people are into the winter season already with snow, but I’m not quite ready to make the jump. Other items by Schultz Bros. I don’t have much time to write anything as it took me quite a bit of time just to put these credits together and I’ve got to get back to work. I had fun doing this picture though. I love kitchen stuff even though I spend very little time in the kitchen these days. I’m showcasing some amazing new releases by some fantastic designers, so make sure you peek below for the details. Hello! This is another scene that I wasn’t sure where it was leading to when I set out to do. 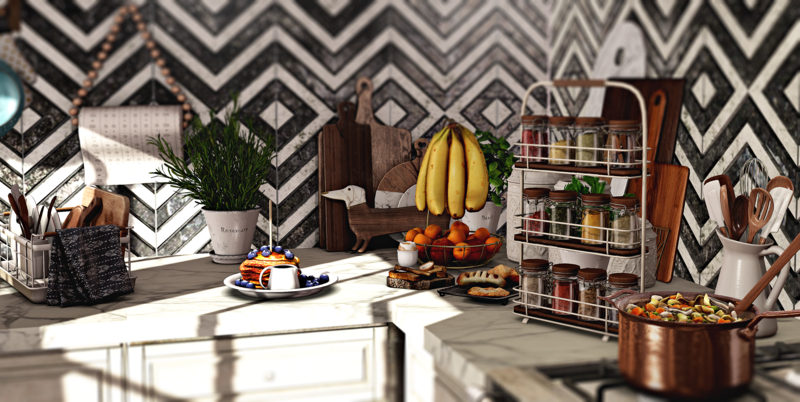 I started with showcasing the amazing Harvest Collection from Hive, which is a mainstore release. Yay! I love that some designers are pulling back from participating in so many events and concentrating on going back to mainstore releases. As I was setting up the hay bales, the thought came that it would really go well with some items from the Arcade. There you have it, my complete scene. The Arcade is still open a few more days, so great time to visit and grab some extra stuff. I’m always thrilled when something quite different is brought to us. I think this gorgeous Victorian home by Schultz Bros. is not your typical and something worth checking out. 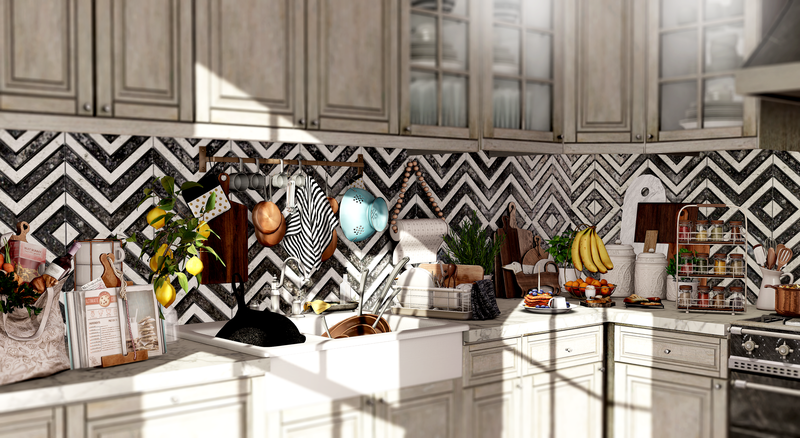 All the details on the home is below credits and can be found at the main store. *Texture change is done through the button in hallway on the First floor. *2 Exterior Siding options: Dark Green & light Green. *First Floor: Entry / Vestibule, Alcove, Parlor, Sitting Room, Dining Room, Hall, Walk through Kitchen w/ Pantry & China closet, Back entrance. Hallway & Kitchen have separate staircase access. *Second Floor: Large Hallway, 3 bedrooms upstairs, each w/ small closet. Master bedroom with interior tower view, front balcony view. *Attic: Large open space attic w/ half moon roof windows. The Hyde Park Victorian is modeled after an original house built 1891. 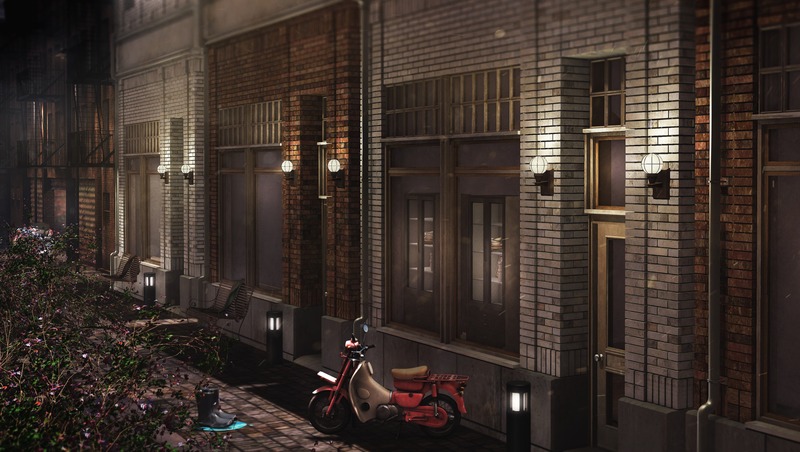 Exteriors are highly Detailed. Features 3D Trim, detail work & 3d siding. All real interior trim, window trims & wainscoting throughout the entire house. Wallpapers, Floors & Ceilings are all changeable by room. (Manually). 3 Chimneys – click top for smoke. All interior doors have been tinted light green. Tint is changeable to whatever color you like. Scaling the house larger will increase land impact. 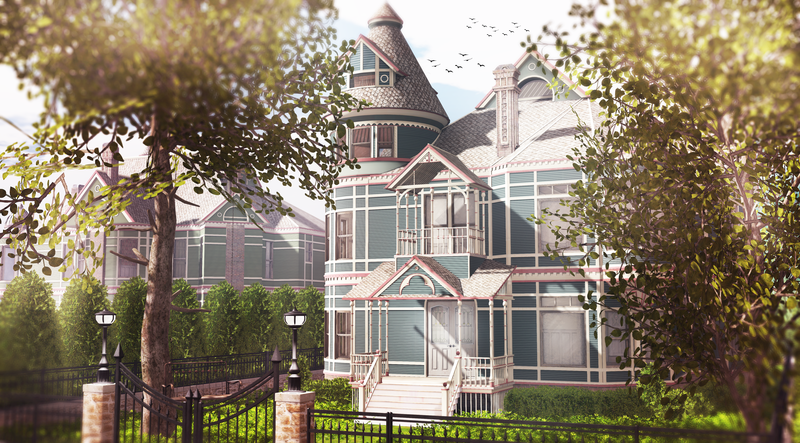 House is modify for tinting, texture changes, etc…. not to unlink & mod. Re-texturing is not guaranteed & may have unexpected results. Summer just got a lot more appetizing. 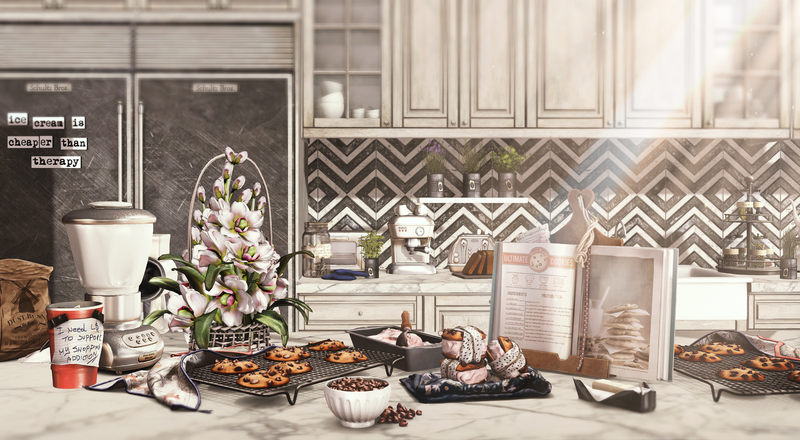 Check out these amazing treats by Dust Bunny, available now at Collabor88. 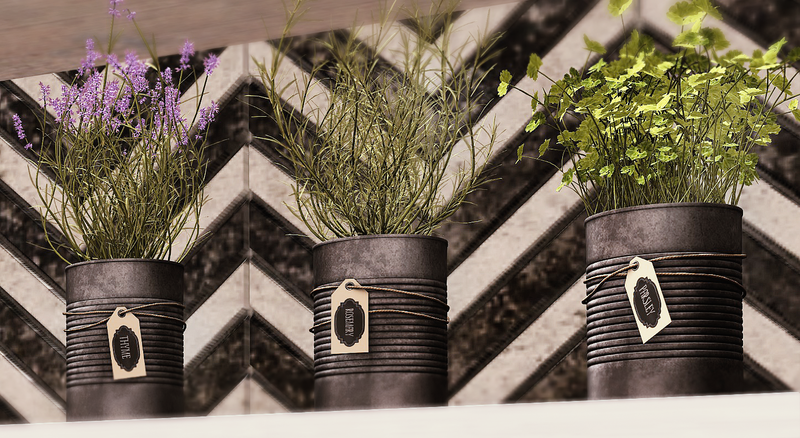 Then hop over to Kustom9 and pick up these delightful tin cans with all the spices you need on hand to make a delicious meal to go with those yummy desserts. Also, Death Row Designs, better known as DRD, has a “Go FUND Yourself Hunt” going on right now. It started June 8th, but you have plenty of time, until June 30th, to visit and grab everything you need to raise a dollar or two. There are 15 original mesh prizes, all free and exclusive.